The voting is over. 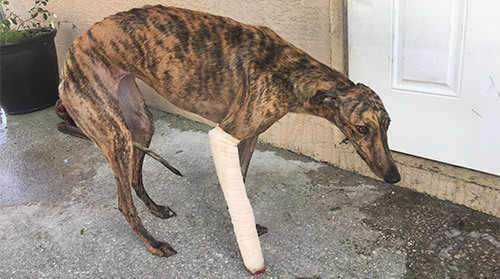 The ballots have been counted and the overwhelming majority of people in Florida have decided to free innocent greyhounds from exploitation, needless injuries and painful deaths. When Amendment 13 was first approved for the ballot in April, there were 12 operating dog tracks in the Sunshine State. A track in Miami decided to close before the vote was even taken. Four more tracks have likely run their last seasons this year and will simply not reopen for live racing ever again. The number of dogs in Florida racing kennels is always in flux, but there were 3,700 active, registered racers as of October and they will continue racing over the two year phase-out triggered by Amendment 13. Some dogs will be sent to tracks outside the state and others will be sent to farms in the Midwest as breeding stock. Let's face it, this is an industry that will always look to make the last dollar it can off the backs of innocent greyhounds. That reality will never change. It is notable that racing proponents continue to claim that 8,000-10,000 greyhounds will become “homeless” with the end of dog racing. Of course, those of us who have been to the concrete warehouses known as racing kennels know that these greyhounds have never had a home to begin with. During the campaign to pass Amendment 13, greyhound breeders relied on a strategy of dissembling, denying and distracting to hide the cruelty at the center of their business. It didn’t work. Amendment 13 passed with 69% of the vote, a vote that cut across party lines, geographic areas and income levels. It seems the one thing the people of Florida could agree on this election cycle was that greyhound racing had to go. Claim #1. The greyhound breed will die out. This is just silly. Greyhounds are among the most ancient breeds, the only dogs named in the Bible. Commercial dog racing has existed for just 87 years. Additionally, most dog breeds today don’t do what they were originally bred for. Most Border Collies don’t herd; most Terriers don’t chase rats; most Poodles don’t hunt ducks or sniff out truffles and yet they all seem to be doing quite well. Expecting greyhounds to disappear because racing ends is like expecting horses to disappear because the internal combustion engine was invented. Greyhounds make wonderful companions. There’s no reason to expect that their transition to full time pets would be any different than any of the other breeds whose original jobs became obsolete. Claim #2. Thousands of greyhounds will be euthanized because they can’t find homes. Simply, no. There will be an influx of greyhounds coming into the adoption system, but it won’t be until the end of 2020. Until then the stream of dogs coming off the tracks is likely to be somewhat less than what it always was, because five tracks are already off the table. In addition, the industry boasts 102 adoption groups approved and ready to take dogs as they become available. This list does not include the large number of adoption groups that have been blacklisted because of their anti-racing stance, but who are ready, willing and able to take dogs as well, if only they would be allowed. In what seems to be a final measure of selfishness, there are those in the industry who not only won’t release dogs to adoption groups with an anti-racing stance, but even want to keep dogs from individuals wanting to adopt if their views are not in line with pro-racing positions. This makes all their hand-wringing about what is going to happen to all these poor dogs looking for homes seem somewhat hypocritical. Claim #3. There will be massive economic upheaval. Again, simply not true. Florida has the fourth biggest economy in the country with a GDP last year of $967.3 billion. Greyhound racing actually costs the state more to regulate than it generates in taxes. Most jobs in dog racing are part-time, low-wage, and offer no benefits. While no one wants to see job loss, there is little evidence to suggest any widespread damage to the economy related to the predictable end of dog racing. Tracks now lose $34 million a year on live racing and as they raze their old tracks and replace them with new hotels, concert centers and more, there will be net job growth. Claim #4. Amendment 13 was only the tip of the iceberg. Hunting and fishing will be next. This breathless delusion was promulgated by the Florida NRA, an organization so paranoid and afraid of anything different that I’m surprised they haven’t issued a statement decrying the change in the seasons as a threat. Amendment 13 was about greyhound racing and that is all. The Florida Supreme Court concluded that ending racing was the single purpose and goal of the amendment. To make the leap from racing to hunting, fishing and guns was more a measure of the industry’s desperation than a logical outcome. You would think that given their massive failure at the ballot box, pro-racing interests would try a different approach now that voters have spoken so decisively. Think again. In their minds, it’s almost as if the election had never happened. They stick to the same distortions, long ago debunked talking points and personal attacks that got them nowhere during the campaign. It will be up to those of us who truly care about the well being of greyhounds to ensure that they are finally given the second chance they deserve. Recently, we asked you to share your greyhound’s story. As with our annual calendar contest, we received entries describing lucky hounds who had been adopted from anti-racing groups, pro-racing groups and groups that claim no position on dog racing. This is something we must all celebrate! In fact, greyhound adoption should never be politicized. The only two questions that should be raised in placing an unwanted puppy or a finished racer are 1) How soon can this dog be transitioned out of the racetrack and 2) Where is the closest, bona fide, adoption group located? Unfortunately, having sensed its coming dissolution for nearly twenty years, the commercial dog racing industry has begun holding greyhounds hostage and purposely limiting access to select adoption groups. In an attempt to blunt criticism, such groups may be required by contract not to speak critically about racing. Nor can they tell about the condition of the injured or sick greyhounds that they receive. Industry bullying is so effective that groups even refuse donations and avoid inclusion on any referral pages deemed to be against racing. Another defense mechanism used to prolong the cruelty of dog racing is the panic-inducing talking point that thousands of greyhounds will die should a track or tracks close. It is true that the number of dogs available for release increases in the wake of a track’s closure, but that increase is temporary. The immediate problem is real, but it’s one that is expected and can be prepared for in advance. The benefits of a track closing are permanent and far-reaching. This is because the cycle of over breeding and killing stops. For good. This is particularly important in Florida, which has an abundance of dogs at breeding farms and racetracks throughout the state. On November 6, when voters decided to phase out dog racing statewide, the historic Miami track was already permanently closed for dog racing, and four other tracks had already held their final season. The remaining seven facilities will now have twenty-six months to wind down and release their dogs to waiting adoption groups both in and out-of-state. As before, we and other non-profit groups are standing by to help and contribute funding during this transition. It is important to understand that the recent claims by Florida kennel operators that dogs “will be killed” is not a passive statement. This is all about control and anyone who utters these words is literally threatening to kill his or her own dogs. Think about that. Just as greyhound adoption groups are bullied, kennel operators are now also trying to bully the general public into voting against helping dogs. Empty threats like these must be considered for the scare tactic that they are. We have heard the same cynicism in Massachusetts, New Hampshire, Arizona and every other state that has rightfully voted to end commercial dog racing. When Tucson Greyhound Park closed, for example, we worked directly with the track owners to fund adoption. In our home state of Massachusetts, there was a record year for adoption following voter approval of the phase-out of dog racing. Historically speaking, when a dog track closes, countless volunteers are mobilized to find homes for any and all displaced dogs. Drivers from hundreds of miles away converge on the track and pick up dogs to be taken to adoption groups and foster homes. For example, when Plainfield Greyhound Park in Connecticut closed in 2005 volunteers from as far away as the Midwest and Canada sent rescuers. The closure of Multnomah Greyhound Park in Oregon in 2004 and Geneva Lakes Greyhound Park in Wisconsin in 2006 sparked a similar response. While some dogs were sent on to race elsewhere, many others were made available for adoption. Later, with the closure of Mile High Park in Colorado (Winter 2008) and The Woodlands in Kansas (Fall 2008), all the dogs were safely moved out. 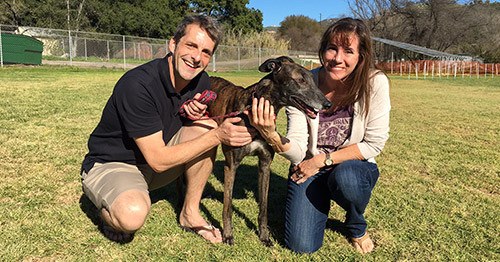 Greyhound advocates, including board members of GREY2K USA, joined hands with track adoption groups to help the dogs. In December 2009, the 200 remaining dogs at Raynham Park were re-homed, and a similar number had been transferred out of Wonderland, also of Massachusetts, when that track held its last season in September of that year. It’s no secret that greyhounds often pay with their lives while competing. They break their necks, suffer paralysis and some are even electrocuted. 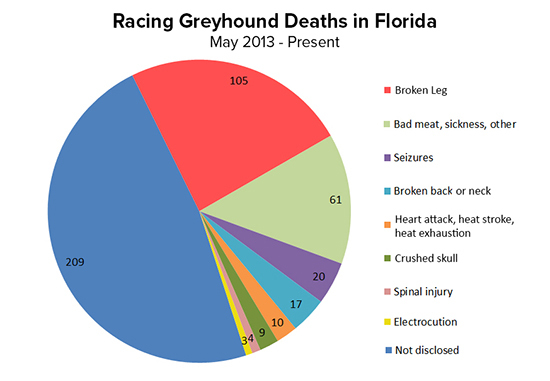 In Florida, state records show that an innocent greyhound dies every three days. This cannot and should not go on. Whether one agrees with Jill or thinks dog racing is the best invention of 1919, the truth is that we all love our greyhounds. Now it’s time to show it. We applaud independent networks like that the Greyhound Adoption Action Alliance for saving dogs now and for preparing to help even more greyhounds as tracks wind down operations in Florida. With the passage of Amendment 13 and as other tracks also close around the country, let’s work together to promote adoption and put the dogs first. Another defense mechanism used to prolong the cruelty of dog racing is the panic-inducing talking point that thousands of greyhounds will die should a track or tracks close. It is true that the number of dogs available for release increases in the wake of a track’s closure, but that increase is temporary. The immediate problem is real, but it’s one that is expected and can be prepared for in advance. The benefits of a track closing are permanent and far-reaching. This is because the cycle of over breeding and killing stops. For good. This is particularly important in Florida, which has an abundance of dogs at breeding farms and racetracks throughout the state. On November 6, when voters decide whether dog racing should be phased out, the historic Miami track will already have stopped dog racing, three other tracks will have ended their final season, and the remaining facilities will have twenty-six months to wind down and release their dogs to waiting adoption groups both in and out-of-state. Will November 6 be Greyhound Independence Day in Florida? In just a few days, the voters of Florida will have a chance to put the archaic, economically unsustainable and dying business of dog racing to rest. If Amendment 13 passes it will phase out this cruel activity by 2020. Florida is home to 11 of the remaining 17 tracks in the United States, so ending racing there will go a long way to freeing greyhounds trapped in racing compounds all over the country. The campaign to end racing has been contentious. Racing supporters have pulled out all the stops in their campaign of intimidation, personal attacks and scare tactics. It comes as no surprise that this would be their strategy since there is no cogent defense of the heartless commodification, exploitation, and eventual abandonment of innocent, helpless greyhounds. 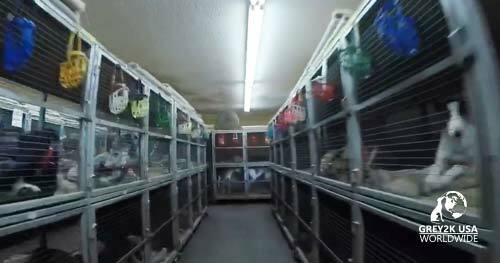 These dogs are brought into this world for the sole purpose of making their owners money. They live in cages at the kennels where their lives are regularly and knowingly put in danger by those owners, and when they can no longer make money, they are discarded by these same owners. That by itself should be enough to vote #YesOn13, but there are other reasons as well. The racing industry argues that it is one of the most highly regulated businesses in the country and that mistreatment of any greyhound is quickly ferreted out and the perpetrator punished. In practice, however, kennel workers who violate the rules are often given a slap on the wrist and allowed to return right back to the track. Thankfully, multiple violations do seem to attract more rule enforcement by state regulators. At Orange Park Kennel Club, for example, Charles F. McClellan was charged with eighteen greyhound cocaine positive infractions, six belonging to the same dog, which resulted in his suspension. McClellan's replacement, Natasha Nemeth, was also cited with six greyhound cocaine positive violations, two from the same greyhounds testing positive under McClellan’s supervision. She was likewise suspended, but both are currently fighting to overturn the state's order. There is a more fundamental reason that regulation will not work, however, that transcends simple economics: regulations only treat the symptoms, not the cause. 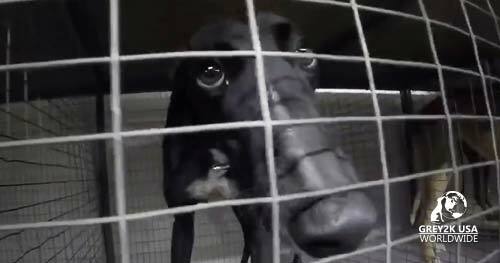 To the racing industry greyhounds are merely a means to an end, and that end is profit. They are not viewed as living creatures capable of feeling joy, or pain, but more like machines that while functioning are maintained in the most cost effective way possible, and when they stop functioning are discarded and replaced by another. This is the cruelty that hides at the center of greyhound racing and no amount of regulation will ever change it. Greyhound racing is a dying industry. In Fiscal Year 2016, the total amount gambled on live racing at Florida dog tracks was $87,738,338. This amounts to a decline of 55% since 2006. Between 2001 and 2014 (the last year the industry will openly publish its numbers), state dog race wagering declined by more than 82% across the country. As revenue to the state dries up, the ability to do enforce even minimal regulations become even more challenging. This also puts the greyhounds in more danger because the temptation to cut corners becomes greater as the money pie shrinks. The voters of Florida have an opportunity to end this institutionalized cruelty. Let's make next Tuesday, November 6, a true Greyhound Independence Day by passing Amendment 13 on the ballot. History awaits the greyhounds this fall. 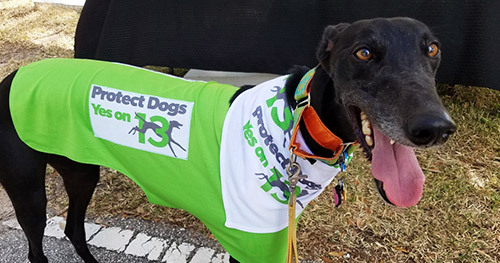 On Election Day, the voters of Florida will have the opportunity to turn back the hands of time and end dog racing in its most established state. As many as 8,000 lucky greyhounds stand to receive the second chance they deserve, closing out nearly 100 years of exploitation and cruelty. 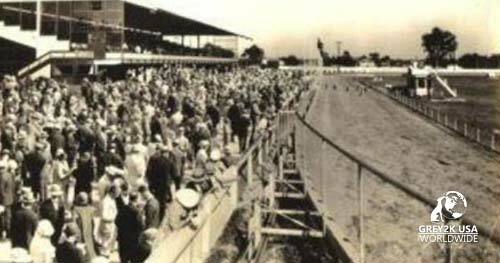 The first recognized commercial greyhound racetrack in the world was opened in 1919 in California. The Blue Star Amusement Park had an oval track and featured a new invention called the mechanical lure. Created by Owen Patrick Smith, the device was intended to offer a more humane alternative to the traditional use of live rabbits in field coursing. By 1930, sixty-seven "flapping" tracks had opened and closed all across the United States – none of them legal. A bid to force approval of dog racing in Kentucky was brought before the U.S. Supreme Court in 1927, but failed. No state would authorize this new business, even during the height of the Great Depression. But Florida was different. It became the first state to allow dog tracks to operate legally – as long as it received a piece of the action. In 1931, Sunshine State lawmakers passed a racing bill over Governor Doyle E. Carlton’s veto. By 1935, there were ten licensed tracks in operation, some controlled by known criminals such as Meyer Lansky. Oregon and Massachusetts became the next states to authorize dog racing, in 1933 and 1934 respectively. Although church groups, civic and humane organizations rallied in opposition, the new industry of greyhound racing continued to grow and was legalized in a total of nineteen states by 1989. Referred to as the “Sport of Queens,” perhaps in reference to Queen Elizabeth I’s promotion of greyhound coursing in the sixteenth century, dog racing sought to promote itself as elite, glamorous and a good time for all, including the greyhounds themselves.Proponents of dog racing in Florida were perhaps the most enthusiastic of all in emphasizing the “sun and fun” to be had at its facilities. Old time movie heartthrobs, entertainers and sports figures such as Joe DiMaggio, Babe Ruth, Janet Leigh (star of Alfred Hitchcock’s “Psycho”) and even Old Blue Eyes himself, Frank Sinatra, made multiple appearances at dog tracks in the Sunshine State. In 1958, Sinatra filmed a movie about a dog track gambler at the Flagler Kennel Club and one year later, he appeared on the cover of the Greyhound Racing Record along with a woman newly crowned as the “Queen of American Greyhound Racing.” Photographed with them was the winning dog in a race named after the famous singer. Those days are long gone and the truth about dog racing has now been revealed in official state documents, financial reports and testimony from dog track workers themselves. Kept in warehouse style kennels, in rows of stacked metal cages for 20-23 hours a day, the dogs are fed a diet based on raw, diseased meat. When let out of their cages to race several times a month, they face the risk of serious injury. Broken legs, crushed skulls, snapped necks, paralysis and heat strokes are common. Some dogs have even been electrocuted while racing. 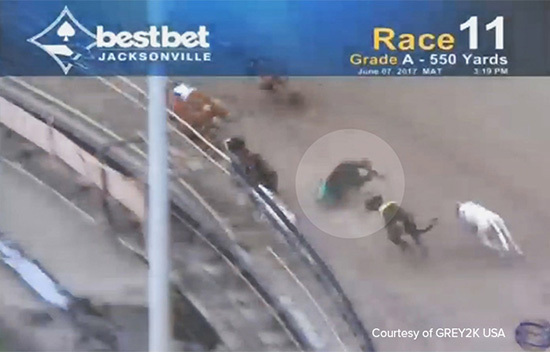 According to information gathered by the state’s Division of Pari-Mutuel Wagering, a greyhound dies every three days at Florida’s eleven racetracks. Cheating is another hallmark of this industry. Over the past decade, there have been 419 greyhound drug positives, including 68 cocaine positives. Greyhounds have also been found with pain killers and opiates like novocaine and oxymorphone in their systems. Females are routinely given anabolic steroids to build muscle and prevent loss of race days during their heat cycles, a practice which triggers both animal welfare and race fixing concerns. Thankfully, dog racing is now illegal in 40 states and since 1990, the amount of money wagered on dog racing in the Sunshine State has plummeted by 74%. Tax revenue has declined by 98% and the tracks themselves now lose a combined $34 million. If it were not for a state mandate requiring racetracks to offer a minimum number of races as the platform for other, more popular forms of gambling, this antiquated activity would have ended long ago. Until it does, the state will continue to waste as much as $3.3 million per year regulating a dying industry. Statewide polling shows that Florida voters will vote to end dog racing if they are fully informed about its humane and economic problems. You can help the greyhounds by learning learn more about Amendment 13 and by spreading the word that it’s time to set the greyhounds free.